The film is directed by 40’s dad, Donald Shebib. 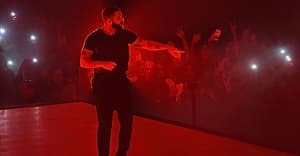 The beginning of "Lose You," track 19 on Drake's new project More Life, appears to contain an unusual sample: the voice of John "Tiny" Taylor, former president of the East Toronto chapter of a motorcycle club called Satan's Choice. The excerpt was taken from a 1966 documentary by the CBC on the group, which you can watch above. The film is directed by Donald Shebib, father of frequent Drake producer Noah "40" Shebib. In the clip, Taylor is disdainful of societal norms and preaches living by one's own set of standards. "I don't care what society thinks," he said. "But they're nothing anyway. They're no better than me. Out there you just have to fit into a pattern that somebody's already laid out for you. Life we live, you have to set your own patterns, your own ideals. You have to handle the whole job yourself." The entire transcript is reproduced word-for-word in Making the Scene: Yorkville and Hip Toronto in the Sixties, a book by Stuart Henderson. Read the excerpt here. In the relevant section, Taylor is discussing tensions between members of Satan's Choice and the local community of Yorkville.